Lowdown: A philosophical attack on religion’s position in society. A tweet from Richard Dawkins alerted me to the existence of A. C. Grayling’s Against All Gods. Shortly afterwards I presented myself at Amazon and opened my credit card wide to pay $10 for this book to land on my Kindle. It was then that I noticed this book is very short, at about 600 Kindle paragraphs (something like 50 conventional pages?). This is no book; it’s rather a booklet, and the fact we are asked to pay a full ebook’s price for it when stuff of this length normally sells for $2-$3 under the emblem of “Kindle single” is outrageous. Once I relaxed from this broad daylight robbery I was able to quickly finish reading the book and report I thoroughly enjoyed it. I wouldn’t say it’s worth its asking price because I think it's hard to put monetary values on good ideas; I will let you decide on your position there. Against All Gods is a book that tries to answer the question of whether religion deserves the place it has enshrined itself in our society. Given that A. C. Grayling is a famous atheist one does not need to resort to the supernatural to figure what the author’s answer would be; the beauty of this book[let] is in the way Grayling provides his answer. The bulk of Against All Gods is a collection of several related essays, each attacking a different aspect of religion’s claims on our lives. The focus is entirely on social affairs; there is no attempt here to prove religion wrong ala The God Delusion, although it is clear Grayling is firmly in Dawkins' camp. 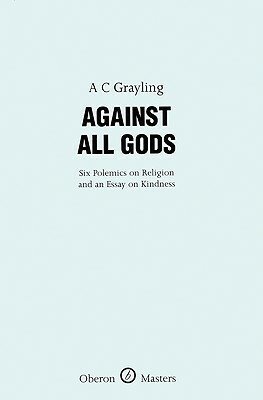 Each of the essays is concise and also rather aggressive in its approach, which is where the beauty of Against All Gods stems from: while the arguments should be familiar to most atheists, the precision, sharpness and language used by Grayling are the cause of pure delight. It is rare to be able to witness arguments so well laid out with regards to anything, let alone the matter of religion. I would argue the last time I have seen arguments so well laid was in... The God Delusion. Reading Grayling here felt like listening to some of my most favorite music: things just streamed along in sheer delight. Finishing things off is an essay set to a different mood, a positive one. Grayling presents us with his suggested fix for the disease of religion, humanism. Things are thus concluded on a high note. Overall: A great read, well worth 5 out of 5 stars, that will definitely make me reach for more of Grayling’s on my bookshelf in the near future. Pity about the pricing, though.